Four young girlfriends head out to the Canadian woods for some downtime. But downtime turns to terror time when they discover a pile of intestines and a pair of severed feet dangling from a tree. The friends begin to realise humans are the preferred prey and that they are being hunted. Armed with bows and arrows, two brutal rednecks are on the rampage and the girls' blood-soaked battle for survival begins. Although a German production directed by the imposingly named Matthias Olof Eich (here making his debut as writer, director and editor) and featuring a largely German cast that includes Lili Schackert, Esther Maaß, Ralph Willmann and Marina Anna Eich, the film is set in Canada and apparently in the English language, which should make it accessible even to horror fans who moan about having to read subtitles. Whether it's that good is a whole different matter – it scores badly on IMDb, but seems to have its supporters in the horror community. You decide. 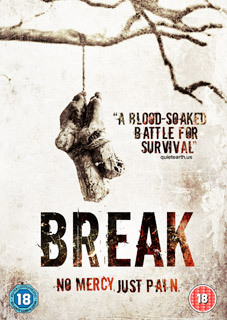 Break (and that's the original title) will be released on UK DVD on 16th April 2012 by Trinity X at the RRP of £17.99. The only extra feature is a trailer, which may well be the one we've embedded below. Break Trailer from Trinity film on Vimeo.